The Pesky Pole : Clay Buchholz: The Mental Giant? 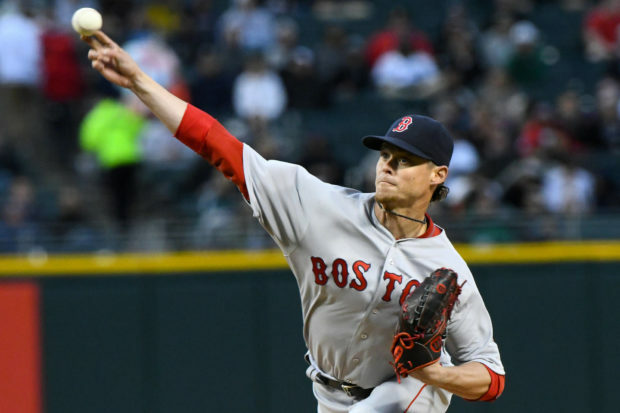 Clay Buchholz: The Mental Giant? I have been back and forth when it comes to Clay Buchholz the pitcher. Before last season I was optimistic that the lack of an "ace" may force Clay to move into that role mentally and finally reach his potential. That didn't happen and on April 29th of last year I wrote him off calling him The Mental Midget. I don't know what is more infuriating when it comes to Clay, his great starts or the starts when he physically and mentally implodes. There is nothing more frustrating than seeing someone with talent unable to fulfill it on a consistent basis. That has been Buchholz in a nut shell for his whole career. Did he turn the corner last night? If you just showed me his pitching line I would tell you of course not. I would explain that this is what Clay does. He gets shelled for a few starts and then pitches great and you convince yourself he has in fact turned the corner. Of course, that has always turned out to be false. Was last night different? Is Clay setting me up again after I swore I was done believing he would ever live up to his potential? I am not ready to buy all in on Clay just yet but my eye brows were raised a bit last night. Clay did something last night that he has never done. He fought through adversity. Usually when Clay has a good night it is because he feels good, his stuff is working, the weather is nice, the strike zone is big and he just has his "A game" going. Kind of like the person who is only pleasant and smiling if everything has gone right so far in their day. If anything, and I mean anything, happens to disrupt Clay his night is usually over pretty quick after. Last night he faced adversity early. Adam Eaton flied out deep to left to start the game. The only reason that ball did not leave the ballpark was because of the wind. Jimmy Rollins then followed with a single and then the big blow came when Jose Abreu went deep for a two run homer. Clay had faced three batters, given up three hard hit balls and he was down 2-0. The Clay Buchholz we know would have folded up like a cheap suit. He didn't. He got nasty instead. Who is this guy I thought? Is this the Clay Buchholz we all know and despise or is this the new Clay Buchholz, The Mental Giant? Stay tuned. Is Xander Bogaerts the Best Hitter in Baseball?